As a centerpiece of its #ChoosePeace summer campaign, Coca-Cola brand Peace Tea is looking to engage and generate goodwill among teens and young adults by using social media and donations to spur random acts of kindness. The promotion: For every follower like of a Facebook or Instagram post from the brand’s “Peace Tea[m]”, Peace Tea will donate $1 to RandomActs.org, a charity that funds random acts of kindness around the world. Followers who share one of the brand’s social media team posts will trigger a $2 donation to the organization. 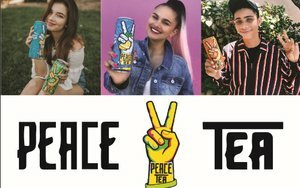 The Peace Tea[m], a group of 20 social influencers tapped by the brand to drive engagement, has a combined following of more than 5.3 million people across their Facebook, Instagram, Twitter, Snapchat, and Musical.ly platforms, according to the company. These Influencers, who include Lela Brown, Alexis Jayde Burnett, Caden Conrique, Branden Harvey, Morgan Harper Nichols and Bryce Xavier, will be sharing about their own acts of kindness starting this week. The influencers — and street teams — will also make appearances at major events over the summer to dispense tea samples and encourage acts of kindness. Acquired in Coca-Cola’s 2014 partnership deal with Monster Beverage — in which Coca-Cola transferred its energy portfolio to Monster, and Monster transferred its non-energy brands to Coca-Cola — Peace Tea is Coca-Cola’s leading tea brand, according to the company.